'Katwijk fishery-, mariner- and other words and locutions'. In 1790 the Society of Dutch Literature received a manuscript from J.K. Valk. According to the accompanying letter, pasted into the front of the manuscript, the donor herewith offered some ‘Katwijk fishery-, mariner- and other words and locutions’(…) ‘for the dictionary’ that the Society intended to publish in those years. 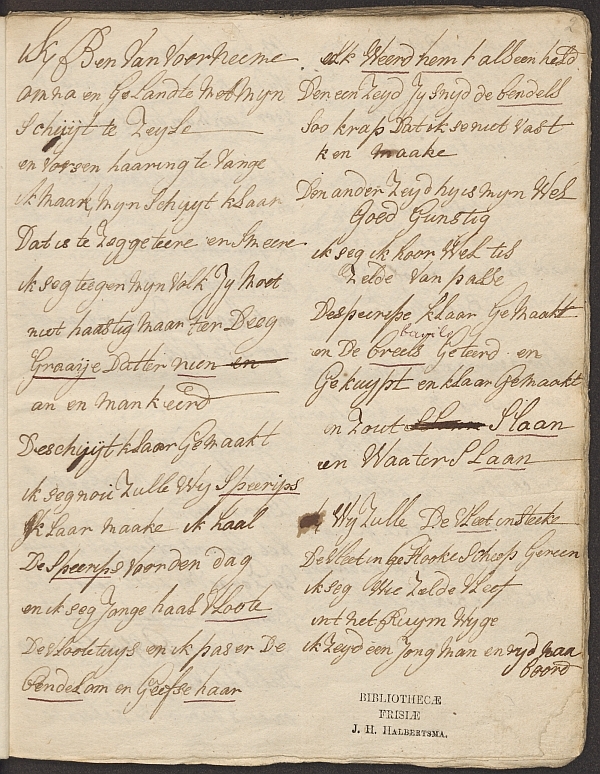 The manuscript was catalogued as Lijst van woorden en spreekwijzen bij de visschers te Katwijk in gebruik (List of Words and Phrases in use with the Fishermen in Katwijk) and is now kept in Leiden University Library under shelfmark LTK 126. Rather soon the reader finds out this is not a list of words and expressions. The title of its transcription by A. Beets is more to the point: ‘Leven en bedrijf aan boord van een Katwijksche visschersschuit in 1790’ (Life and work aboard a Katwijk fishing barge in 1790). The transcription appeared in the Jaarboekje voor geschiedenis en oudheidkunde van Leiden en Rijnland for 1927-1928. The text is an account of two fishing journeys: one is a fishing trip with the vleet, a drift net the fishermen use to catch herring, the other a trip with a so-called schrobnet (trawl), to catch other fish. The stories occur in the eighteenth century, the time of the early bomb barges. A bomb barge (Dutch: bomschuit) is a type of flat-bottomed fishing vessel that launched directly from the beach. Recently it was also discovered who authored the manuscript. The narrator who refers to himself as Leen Vink in it, in real life turns out to bear the name Leendert Buijsertszoon van der Plas (1758-1835). Vink was his alias. We may consider ourselves fortunate in that the Society of Dutch Literature still has the manuscript in its possession. In the years following 1790, to wit, for some time it resided in Deventer and also Leeuwarden. From the stamp on its first page it becomes clear that the manuscript has once been part of the library of the Frisian preacher and man of letters J.H. Halbertsma (1789-1869) in Deventer. Following his passing the Friesland Provincial library in Leeuwarden inherited his library. No doubt a regardful library assistant noticed the appended letter by Valk inside it and saw to it that the manuscript was returned to Leiden. Now the manuscript can also be admired in form of a book. Aan boord van een Katwijkse bomschuit in de achttiende eeuw. Het handschrift van schipper Leendert Buijsertszoon van der Plas, with a facsimile of the manuscript together with a transcription and modernized language version appeared at Primavera Pers. Post by Leendert de Vink, staff member of Leiden University Libraries.